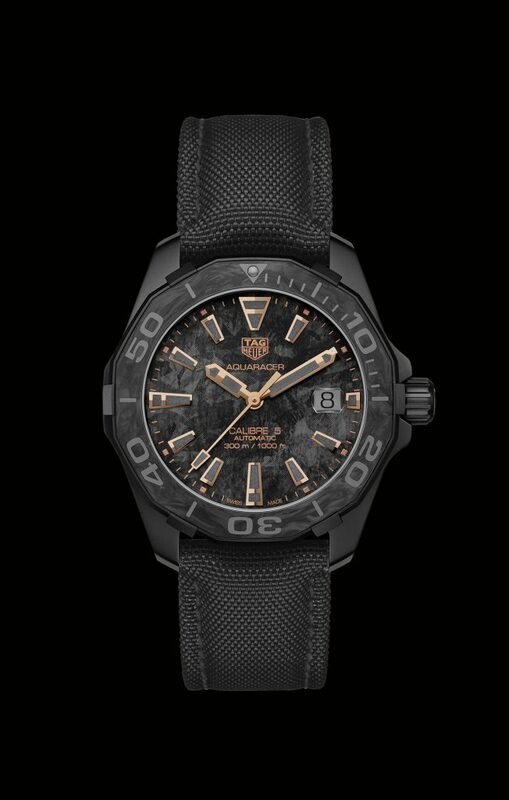 Because TAG Heuer always needs to be on the cutting edge of cool and sleek, the brand unveils a new version of its beloved Aquaracer dive watch: Carbon Aquaracer. 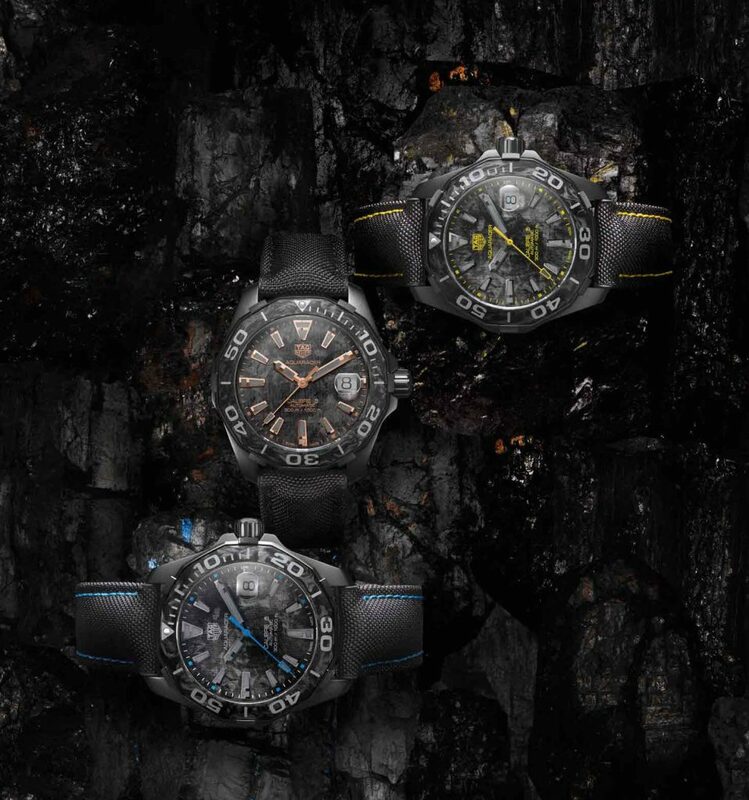 Crafted in PVD titanium, the watches — which are water resistant to 300 meters — are ultra lightweight. The newest series was inspired by the Monaco Bamford watch, created in cooperation with Bamford Watches. Thanks to the random injection of carbon fibres into a resin pressed at high temperatures, each piece is unique, boasting an exclusive black and grey marbled motif. 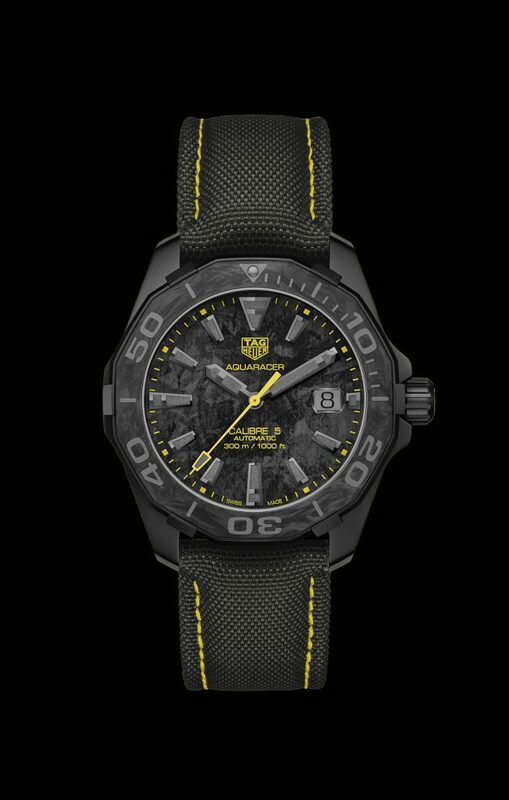 The 41mm PVD titanium Carbon Aquaracer is available in three models, each with hints of blue, yellow or rose gold hues on the carbon-effect dial. They also feature a unidirectional rotating carbon bezel. The dial boasts an imitation carbon effect with a pop of color on each dial. The ultra-lightweight Carbon Aqua racer houses the Caliber 5 movement. Each watch features a sapphire crystal with anti-reflective coating, screw-on case back in grade 5 titanium with black PVD and faceted indexes, and numerals and hands that are polished and lacquered in rose gold or plated with black gold with grey SuperLuminova®.The central hand is lacquered to match the dial accent color (rose gold, yellow or blue) and also features SuperLumiNova. The Carbon Aquaracer is finished by a black textile strap whose topstitching is color-coordinated with the dial accent color. It is a boutique exclusive and is available immediately. They retail for $4,000, with the rose-gold accented version selling for $4,050. Also available now is the Monaco Bamford, the first collaboration in the serial production of a watch for Bamford Watch Department. 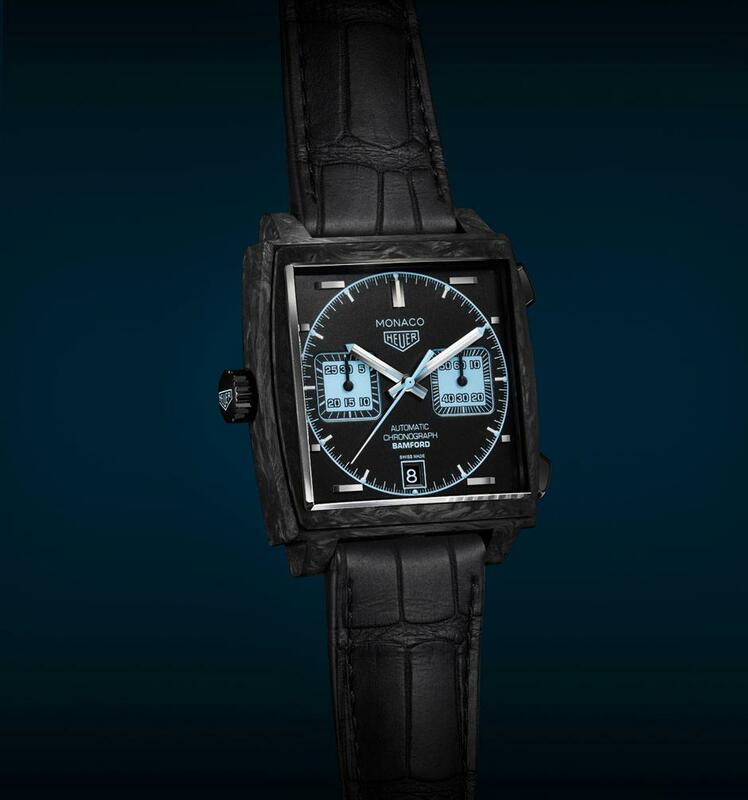 Using the iconic TAG Heuer Monaco case, the watch sports a solid carbon case and an elegant full black dial with incredible aquablue accents. That watch, which retails for $8,100, is finally in stores.